Our group was established in 2001 as a branch of Grupo de Capoeira Angola Pelourinho (GCAP) based in Salvador, Brazil. Under the instruction of Mestre Moraes, we are pursuing the research, practice, and education of capoeira Angola. We are seeking new discoveries every day through the sincere study of capoeira Angola. GCAP is a non-profit organization, and all participant fees contribute towards the management of the group. Wednesdays and Saturdays are group lessons, and there is usually a roda held every Month. Participants should wear a t-shirt, trousers suitable for training, and trainers or sneakers. Fee ： Member of Monthly fee is 5000yen Observation of the class is free. Venue ： Shinagawa Culture Center, 3F or 4F (please refer to the white board near the entrance). Born in salvador, Brazil on February 9, 1950. From the age of 8, he started training at Mestre Pastinha’s Academia de Capoeira Angola where he was taught by Mestre João Grande among others. 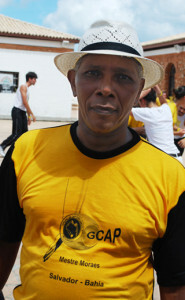 He then moved to Rio de Janeiro where in 1980 he formed the group Grupo de Capoeira Angola Pelourinho (GCAP). After two years, he moved back to his hometown of Bahia in Salvador where he turned all his efforts to promoting the art and culture of Capoeira Angola. He has received invitations to participate in a number of capoeira events worldwide, and he continues to convey with the same energy his own world of capoeira to capoeira students around the world. He made his first trip to Brazil in 2000. In the same year, he became a member of Grupo de Capoeira Angola Pelourinho, learning under Mestre Moraes. 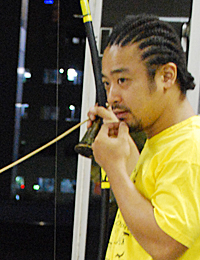 After returning in 2001, he invited Mestre Moraes to Japan, and in the same year on November 29, Grupo de Capoeira Angola Pelourinho Japão was established. 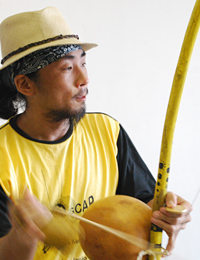 He has continued to make numerous trips to Brazil ever since, devoting his energy to workshops and other activities to promote capoeira within Japan and Brazil. His continued efforts were recognized by Mestre Moraes on April 26, 2007, when he was given the position of Contra-Mestre (assistant to the master), and again on February 6, 2010 when he was granted the title of Mestre (master). 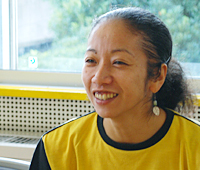 She is one of the founding members of GCAP Japão and has spent a number of years training with the central GCAP school in Salvador. She was granted the title of Contra-Mestre in September of 2010. He has continued to train with GCAP Japao ever since. 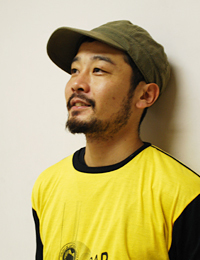 Currently, he is living in Hamamatsu City in Shizuoka Prefecture where he continues activities as a GCAP member. Please write to the following address for questions relating to lessons, rodas, and events.